Products from Galena Outdoor Products LLC | Hunting Ground Blind Supplies, Hunting Blind Gear & Hub Blind Products | Hunting Blind Shelf. Allow me to introduce myself. 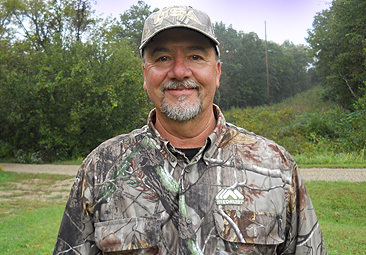 My name is Steve Knasko and I am a Deer and Turkey addict and CEO and founder of Galena Outdoor Products LLC. I started Galena Outdoor Products because of my passion for hunting. It drives me to think "Is there a better way to do this and what can I create to make this better." I enjoy filming my hunts whenever I can and hunting in a ground blind with a tripod which makes for very little room. So I came up with my idea of a bracket that would work in all hub style ground blinds. It is lightweight and very compact in design. It can be converted to a excellent Bow holder with the addition of a simple cradle. I then went a step further and designed a utility shelf using the same bracket. Having your hunting gear close at hand is priceless.